By the time Scott Glover set his sights on the nation’s prescription drug abuse epidemic, he had already proved himself to be one of the most talented investigative journalists in the Los Angeles Times newsroom. His instinct for identifying betrayals of the public trust—and the resourcefulness with which he went after those responsible—had led to some of the paper’s biggest scoops. Together with his longtime reporting partner, Matt Lait, he had exposed the LAPD’s Rampart scandal, helped free an innocent man serving a life sentence for murder, and uncovered a broken health care system at Los Angeles County jails responsible for 14 inmate deaths. So when Glover began reporting on several rogue physicians who were writing painkiller prescriptions for cash, careful readers of the Times quickly saw he was onto something. Most of these doctors had catered to “patients” seeking access to opioids, which are chemical cousins of heroin. In one early article Glover wrote about a San Fernando doctor who had prescribed addicts and drug dealers more than 70,000 pills’ worth of OxyContin, the best-selling opioid in America. In the spring of 2013, Girion and Glover launched a new probe into Purdue Pharma, the Stamford, Connecticut-based maker of OxyContin. Purdue had already earned a reputation as a bad corporate actor. In 2007, the company (as well as three of its executives) had pleaded guilty to fraudulent marketing practices and paid a $470 million fine. Working under the supervision of Lait, who was now the Times law enforcement editor, the reporters would obtain and analyze thousands of pages of leaked company memos and e-mails and sealed court documents as well as reach out to victims, bereaved families, and current and former Purdue employees. The pattern of wrongdoing they gradually pieced together was astonishing even in light of Purdue’s past criminal conduct. Lait edited a number of articles in the reporters’ multipart series, and in the spring of 2014 he sent them to Times editor-in-chief Davan Maharaj. That, according to multiple sources with knowledge of the situation, was when the trouble began. For at least 15 months Maharaj would subject the OxyContin series to a cycle of pointless delays, while at times disregarding and denigrating its authors. Occasionally he would offer comments so ill defined and arbitrary, they couldn’t really be called suggestions; for months he would refuse to discuss the story at all. Even after Maharaj surrendered control to his managing editor, Marc Duvoisin, and after another talented reporter, Harriet Ryan, joined the team, the OxyContin series would face yet more maddening obstacles. For the past ten years the Los Angeles Times’s front office has been a reluctant player in a high-stakes vaudeville show that, no matter how much groaning from the audience, never seems to get closer to its grand finale. Let’s set Act I in 2007, when an erratic and profane real estate billionaire named Sam Zell took the paper’s beleaguered parent company private, financing the deal in part through a raid on the employee retirement plan. Soon after acquiring Chicago-based Tribune Co., Zell met with Times employees, vowing to inject new energy into a journalistic relic. “The challenge is, how do we get somebody 126 years old to get it up?” asked Zell, referring to the paper. “Well, I’m your Viagra.” Instead he was cyanide. Within a year the enormous debt he had piled up, coupled with the stock market panic of 2008, brought the curtain crashing down. Act II opened in U.S. bankruptcy court, where Tribune Co. would remain for the next four years. That period, marked by punishing layoffs and buyouts and drastic drops in circulation and advertising revenue at the Times, reached its crescendo when the company spun off its underperforming newspapers into Tribune Publishing while retaining its more lucrative portfolio of TV stations and digital ventures. Act III began in February 2016 with Chicago tech investor Michael W. Ferro Jr. seizing control of Tribune Publishing via a $44 million stock buy and getting himself named chairman. In the summer Ferro mystified media critics and Wall Street analysts with a strategy that, among other things, would focus on “leveraging artificial intelligence and machine learning to improve user experience.” He envisioned turning the Times into a “global entertainment brand,” with bureaus in overseas media capitals from Lagos, Nigeria, to Hong Kong. (So far neither of these initiatives have gotten off the drawing board.) To better embody this new internet-age dynamism, Ferro changed the name of the company to the much-maligned tronc—short for Tribune Online Content. Last summer Gannett Company, owner of USA Today and more than 100 other newspapers, debuted as tronc’s besotted suitor. Repeatedly Gannett would propose a merger, and Ferro, with melodramatic flair, would reject it (Gannett was “trying to steal the company,” he declared), which only caused America’s dominant print media conglomerate to return with more lavish enticements. Tronc’s largest institutional investors stewed in the background as its chairman refused to sell the company for twice what it was worth. To strengthen his hold, Ferro invited biotech entrepreneur Patrick Soon-Shiong—L.A.’s second-richest person, with a reported $9 billion net worth—into the fray, selling him a 13 percent stake in tronc and granting him a seat on the board. Facing a shareholder lawsuit, Ferro kept his audience in suspense for several weeks in October as rumors flew that the two companies had all but clinched an agreement. On November 1 Gannett abruptly announced the deal was dead, and the stage went dark. The curtain should soon lift again: In recent weeks Ferro and Soon-Shiong have each been purchasing big blocks of tronc stock, which plummeted when Gannett walked away. For eight months I’ve kept a close eye on these theatrics—and the drama unfolding within the Times newsroom—while reporting this story. It’s an article I’ve long wanted to write. As a subscriber for a couple of decades and as an L.A. journalist who has competed against the paper more than once, I believe fiercely in the Times’s importance to the civic life of the city, the state, and the nation. My wife used to work at the paper, I regularly wrote for its now-defunct Sunday magazine, and I even applied for a job there some years ago. 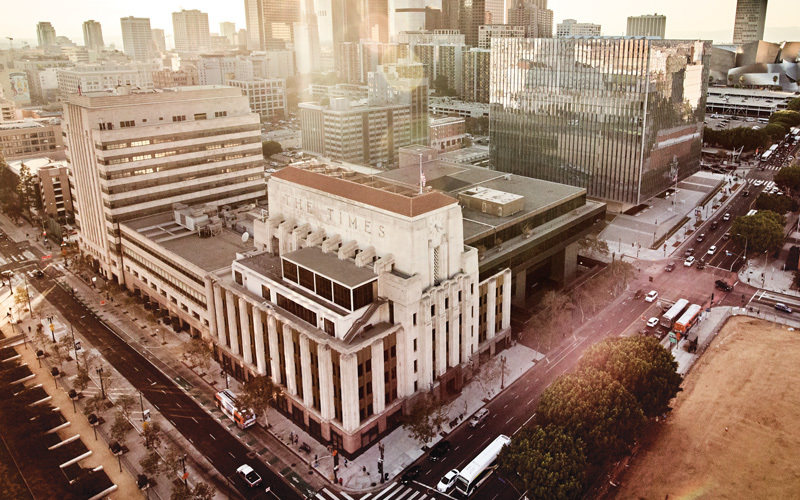 More than ever, we need a consistent, forceful Los Angeles Times—one that can cut through the fog of the blogosphere and provide context and authoritative analysis. Without wanting to sound like too much of a booster, I want the paper to not just survive but thrive. Yes, the Times is a much smaller enterprise—with around 430 staffers, the newsroom is a third of the size it was 16 years ago. But in a country that lost 126 daily papers between 2004 and 2014, it still has the fifth-largest editorial staff (behind The Wall Street Journal, USA Today, The New York Times, and The Washington Post). And despite ten years of upheaval, the paper continues to publish a lot of great journalism. Last October the Times broke two huge stories: one about thousands of California National Guard veterans who were being forced to pay back enlistment bonuses granted to them in error (a few days later the Pentagon told its in-house collection agency to back off), the other about $600,000 in suspect campaign donations allegedly funneled to local politicians by a developer seeking waivers to build a $72 million apartment complex in a neighborhood zoned for heavy industry (the next day the L.A. County district attorney’s office launched a review). The paper has delved deeply into Greater L.A.’s homeless crisis, the corrupt state coastal commission (columnist Steve Lopez has been relentless), and mass suffering and human rights violations across Africa (foreign correspondent Robyn Dixon’s courageous reporting has no peer in the profession). Today, however, the most impactful articles tend to stand out from the rest of the paper as excellent anomalies. It was not always this way. Previously the Times regularly recruited seasoned staffers from other papers. In recent years newsroom gaps have been filled with younger, less experienced hires. From the spring of 1960, when publisher Otis Chandler began transforming the paper into one of the nation’s three most acclaimed dailies, until the mid-2000s, when editors John Carroll, Dean Baquet, and James O’Shea resigned in quick succession rather than further cut their workforce, there had been certain requirements for a prospective Times editor-in-chief. Successful applicants had either done Pulitzer Prize-winning work as writers or editors or served with distinction as top editors of another major newspaper or weekly newsmagazine. The selection of Russ Stanton as O’Shea’s replacement in 2008 signaled how much the job parameters had changed. When offered the position, Stanton had just completed 11 months as innovation editor, helping to bring the paper’s sluggish digital division up to speed. Before that, he had edited the Times business section. Stanton had no Pulitzer, but he did possess a quality that his predecessors lacked: the willingness to implement wave after wave of buyouts and layoffs. When Davan Maharaj was picked to lead the paper at age 49, he was Stanton’s managing editor. Born in Trinidad and Tobago, Maharaj earned a political science degree at the University of Tennessee at Chattanooga. He came to the paper in 1989 as a summer intern after a talent spotter from the Times’s minority recruitment program encountered him at a job fair, and he has remained there his entire career. After eight years with the Orange County edition, he was promoted regularly—he served for a time as a foreign correspondent, among the paper’s highest honors. But more than his reporting chops or his writing style, it was his personality that seemed his most vital asset. During Maharaj’s 15 years as a reporter and 7 as an editor, he had won over many colleagues with his wit, charm, and readiness with a quick joke. Several counted him as a friend. Maharaj’s signature conviviality, according to several sources, was replaced by a grim determination to tighten his grip on power. For this fight he recruited one key ally. Marc Duvoisin was serving as the paper’s deputy managing editor for projects and enterprise reporting when Maharaj promoted him to managing editor. Few colleagues would have called Duvoisin the obvious choice. Generally managing editors must draw on considerable people skills to direct the staff on a day-to-day basis. But “approachability” is not a word that newsroom sources used when explaining Duvoisin to me. “Socially awkward” and “insincere” were among their more common characterizations. Nevertheless Duvoisin has emerged, many say, as the linchpin of the Times’s top command. Whether that’s good or bad is a subject of debate. One critic went so far as to call Duvoisin “Davan’s Rasputin.” But others cast him more as savior than tormenter. “Davan will make a mess of things, and Marc will clean it up and get it into the paper,” another source said. “He is the only thing standing between a semifunctional paper and the chaos of Davan.” As for Maharaj, several sources confirmed that one of his nicknames around the office is “Dear Leader”—the same term that oppressed North Koreans were compelled to use when speaking about the late dictator Kim-Jong Il. 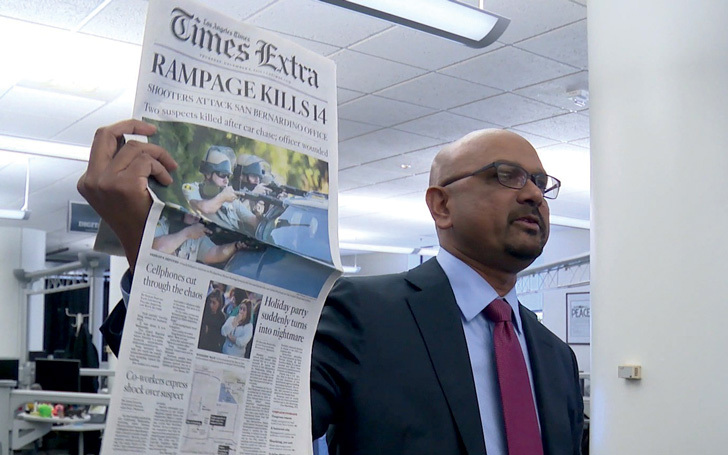 I had hoped to get a more affirmative take on Maharaj’s leadership from Maharaj himself as well as to learn about his plans for the paper’s future. Last May he delivered the opening remarks at a two-day conference celebrating 100 years of the Pulitzer Prizes, and after he was done, I walked up and introduced myself. Tall and elegant in a dark, well-tailored suit and crimson tie, he was cordial and courteous and suggested that I contact the Times’s communications department to arrange a date for us to talk—which I did repeatedly. Over the next six months Maharaj would decline interview requests. I spoke to more than 40 former and current staffers to report this story, most of whom requested that their comments remain off the record. Those still working at the paper feared retribution, and the overwhelming majority of ex-staffers were contractually prohibited from discussing the circumstances of their exit and from voicing anything negative about the newsroom under Maharaj. In exchange for a severance payout, the Times had compelled them to sign nondisclosure agreements that include nondisparagement clauses. The practice is common enough within corporate America but rare for an enterprise tasked with divulging truths that powerful forces are intent on keeping secret. “For a news organization, a nondisparagement clause is abhorrent,” said Jim Newton, who spent 25 years at the Times as a reporter, Metro columnist, and, later, editorial page editor before resigning in 2014. “It’s completely counter to our mission.” It’s also proved largely effective at shielding the paper’s leadership from public scrutiny. Maharaj is wrapping up his fifth year as editor-in-chief with far more power than when he began. Last March, in an unusual move that breaks with journalistic tradition, Ferro merged the position of publisher and editor for all tronc papers, meaning that Maharaj gained control of the Times business operations as well as the newsroom. While he still answers to Ferro, within the world of the Times, he is accountable to no one save himself.